I got to spend St Stephen's Day with 18,000+ others watching Felipe Contepomi clock up the points in a 29-0 victory over Ulster. It was definitely a game of two halves - the first half it seemed everyone, players and supporters, were still suffering the after effects of too much Christmas turkey. 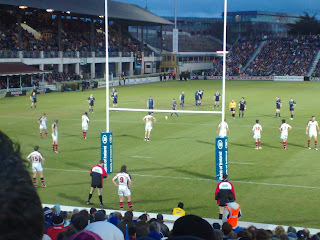 The second half was much more entertaining, especially for those of us in the North Stand (from where I took this photo) as we got to see Leinster's excellent tries close up. A guy in a bar leant over to the guy next to him and said, "Wanna hear a blonde joke?" The guy next to him replied, "Well before you tell that joke, you should know something. I am 6' tall, 200 lbs and I am blond. The guy sitting next to me is 6'2, weighs 225 and he's blond. The fella next to him is 6'5" and 250 and blond. Now, you still wanna tell that joke?" The first guy said, "Nah, not if I'm gonna have to explain it three times." A extremely helpful blog post. The way you have share this knowledge is truly very grateful. Wish to see more on this subject here. Thanks for posting this knowledge here.